Indulge in the privilege of a birds-eye view to the mesmerizing Santorini, along with the luxury and comfort of three singular villas destined to set the tone for an impeccable stay. Santorini Soul Villas will awaken your senses and nourish your soul with a calming earthy palette and a captivating soft minimalism. A wonderful alternation of textures, elegant decorative elements and natural materials like wood, marble and cement,breeze in the villas’ light- filled spaces. As they alternate through the friendly curves and arches of the villas, many charming relaxing spots are created, while the windows and terraces of the villas offeri mpressive views. 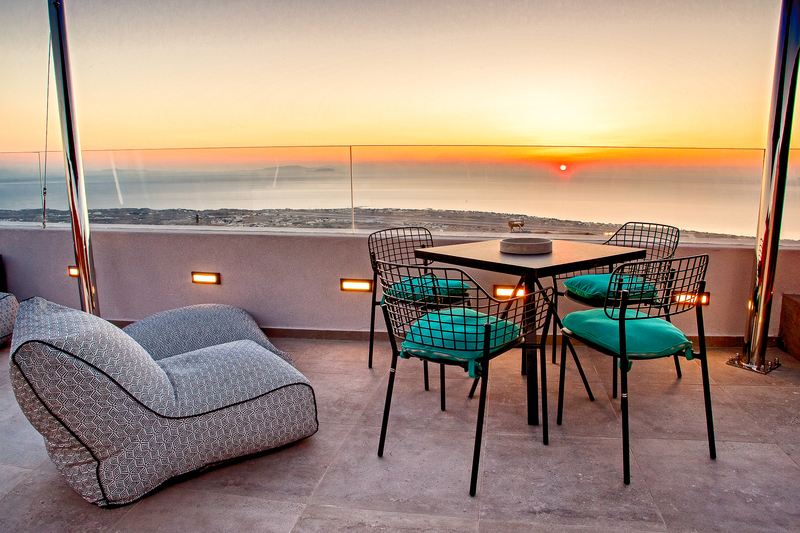 Santorini Soul Villas are the perfect hideaway to let go, unwind and allow your stress to soak in the Jacuzzi, as you watch the sun disappear in the sea, painting the sky and the island gold. The soul of Cycladic beauty, is perfectly illustrated by Santorini Soul Villas; S Villa, U Villa, L Villa: a new concept of upscale hospitality infused by the magic wildness, serenity and warmth of Santorini. Designed and created under the supervision Kiros Pagalidis and architects, Thrapsiadou Virginia Building restoration & renovation engineer BSc, Daskalaki Eri architect.